Bryan and I have been discussing “upgrading” to a bigger house. Which means, we are now looking at our home with a more critical eye. What will potential buyers see? Over Easter we were talking about it and Bryan very vehemently stated that he HATES the wallpaper in the kitchen. From the conviction of his statement you would think the wallpaper had done him some deep, personal injury simply by existing. We agreed to remove the wallpaper and paint the walls. Then, as these projects often do, there was a bit of scope creep. 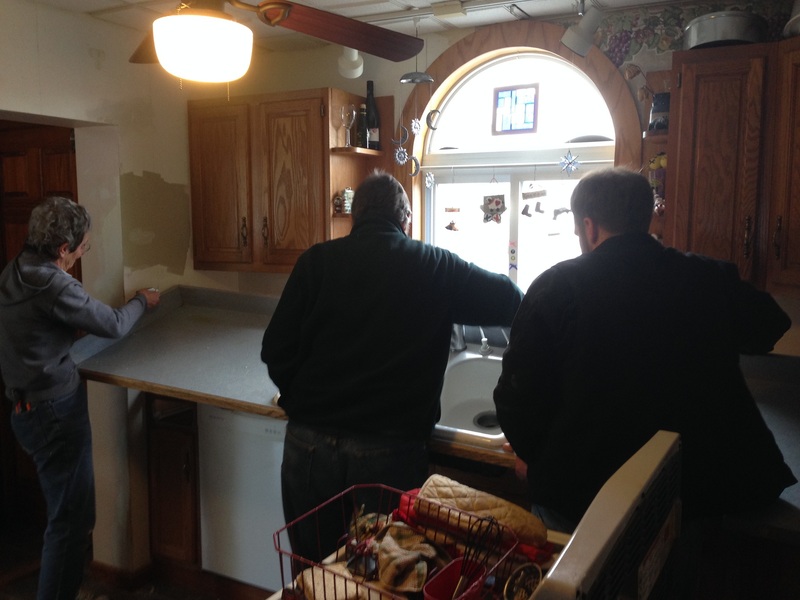 While we aren’t doing a total overhaul, complete with replacing appliance, we have decided to replace the counter-tops and sink along with the wallpaper/paint switch. Then came the decision making process. Our kitchen is small-ish with slate blue floors, oak cabinets, and white appliances. That’s what we had to work with. As always, when you don’t have a blank page to work with trying to see the possibilities can be challenging. We decided on going with tumbled roca laminate counters which has different shades of beige, white, and tan with some flecks of blue and green (nicely ties the floor in). After many trips to the store for paint samples we settled on Celery Powder which is a light muted greenish color. The project should have started with a bunch of before pictures but alas, we forgot to. Step 1: Remove wallpaper. (Saturday and Sunday) My mom did the bulk of this work but I got to share in the “fun”. The basic process is to peel off as much of the “surface” wallpaper (basically the color/pattern you see) as possible which leaves the water soluble layer and glue to go. Then you take a bucket of water and sponge and wipe down the walls. 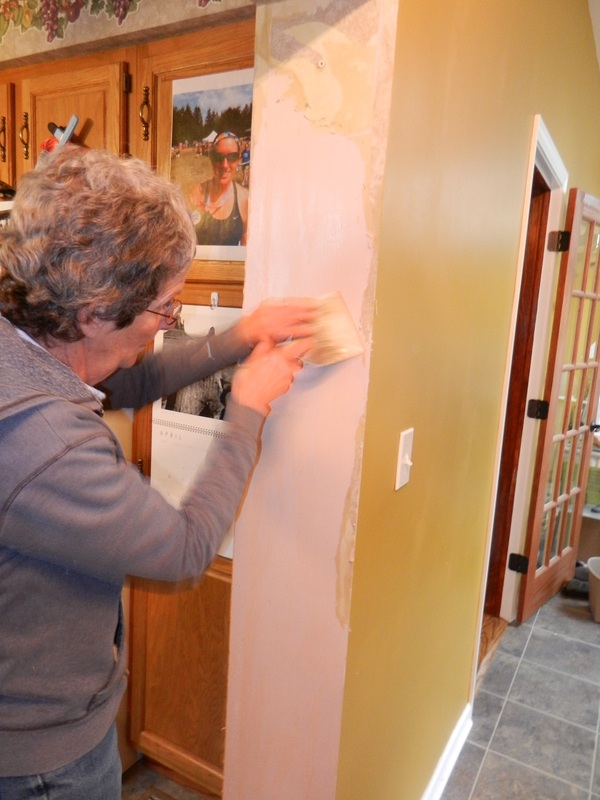 You want to get the wallpaper wet so the glue will loosen but not so wet as water is dripping off the walls. Wait about 10 minutes and scrap off what you can with a putty knife. Repeat as many times as necessary. Also important, make sure you get ALL of the glue off. And putty any of the many issues you uncover. 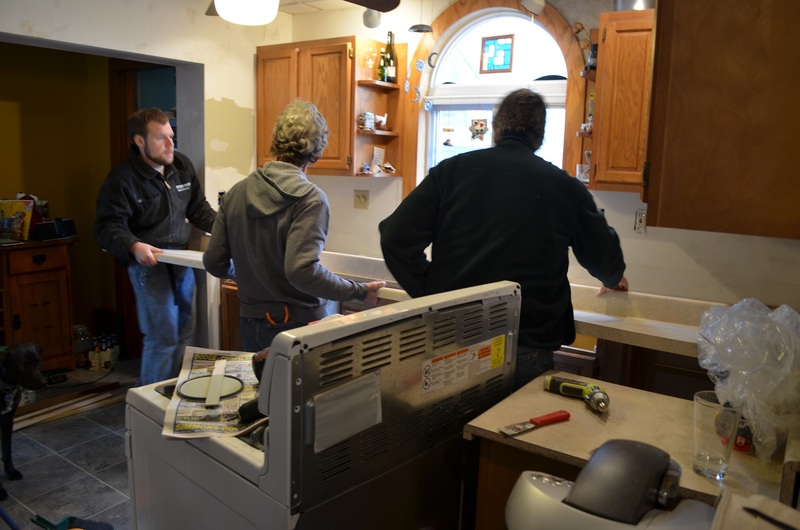 Step 2: Remove and replace counter-tops. (Saturday and Sunday) This was what my dad and Bryan tackled. And for some of it, tackling is a very appropriate word. 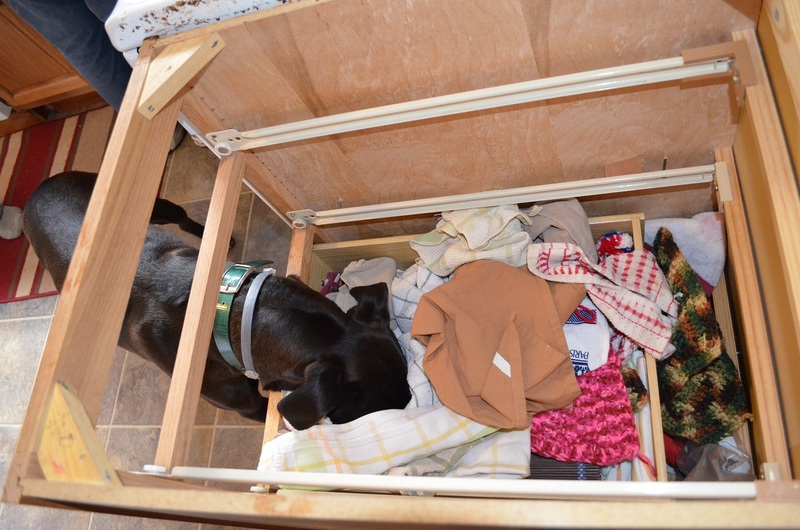 The common thread with the various home improvement projects so far is the phrase “Why the heck did they do it that way?” or the variation of “What were they thinking?” The counter-tops were screwed on in no discernible fashion. The screws also may have been the longest freakin’ screws in existence. The way the plumbing for the sink is run you have to do all sort of funky things to hook up the drains. The sink is porcelain (chipped with very bad repair job) which could not be removed from the counter. The part to make this even more fun it the counters L-shape and that it is right next to the oven/stove so that needs to be maneuvered around. All around this makes for a VERY heavy unit. 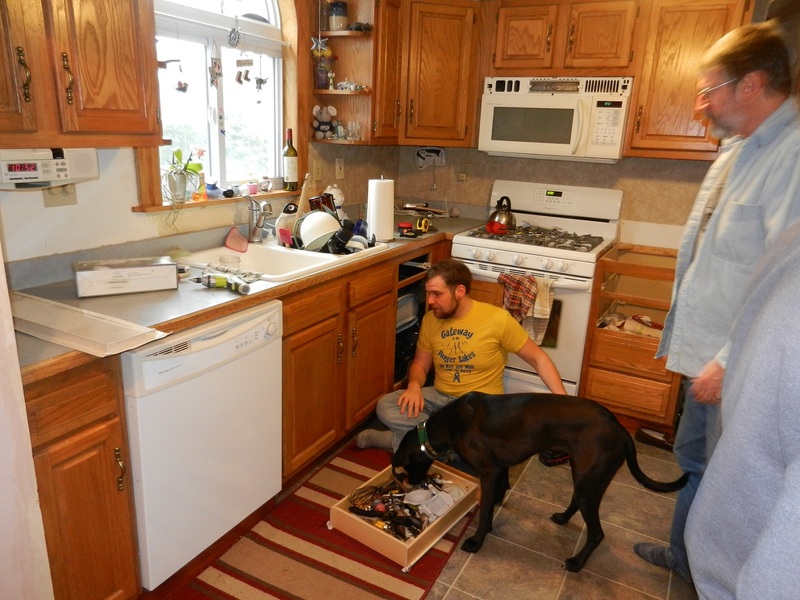 After manhandling it out of the cabinets and outside they started putting in the new counters. Cutting them didn’t seem too hard (says the person not cutting) other than lining up the L properly since the corner isn’t totally square. 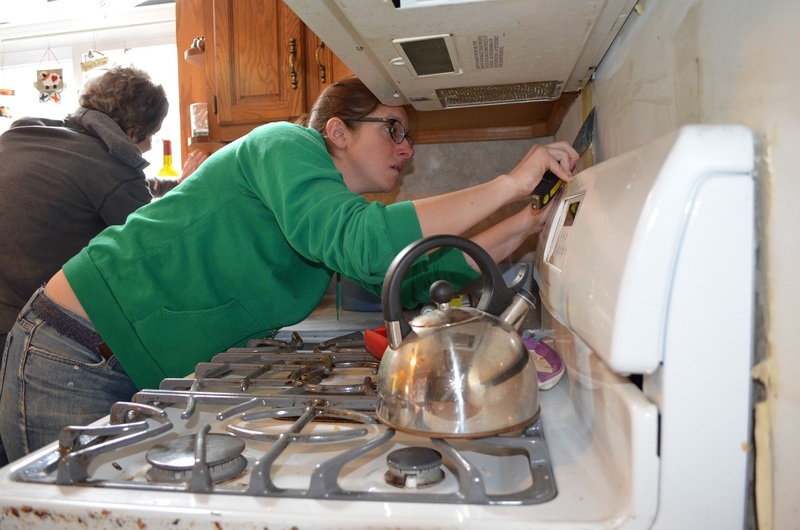 We also found out that on the long wall there is a bow of about 1/4″ which means the counters would need to be sanded to fit the wall. Instead of that we headed to Home Depot and got nifty tiles to put up for an additional backsplash/decoration. Problem solved. Then came putting in the sink. Decision time. 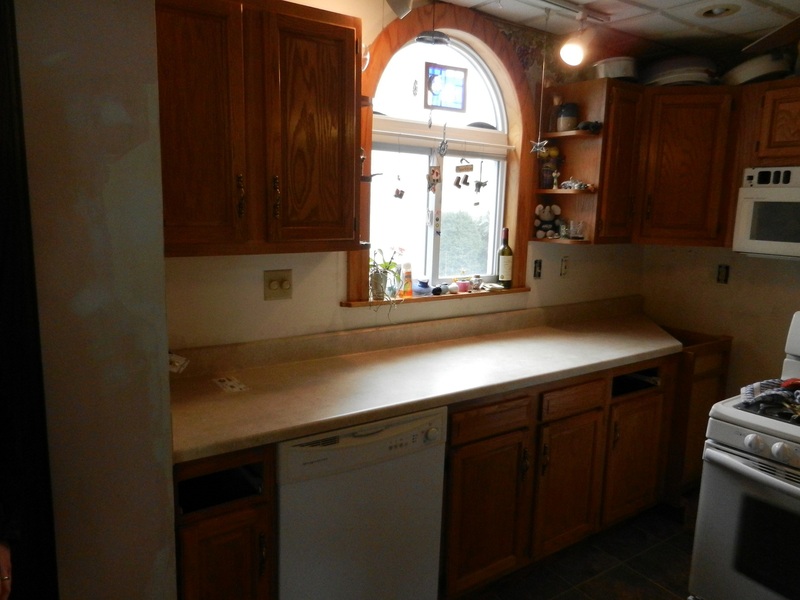 Do we want the center of the sink to line up with the center or the window over it or the center of the cabinets under it. We went with window. The sink dropped in perfectly! 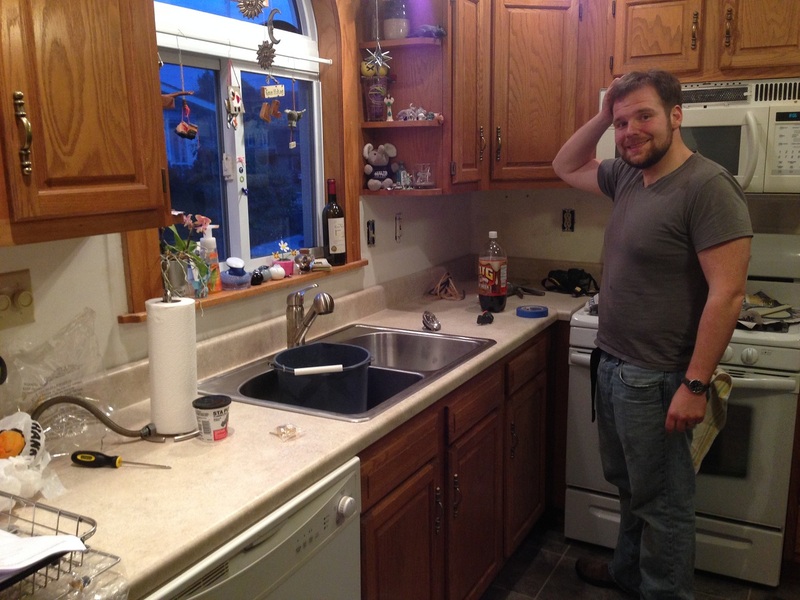 Step 2a: Finish plumbing. 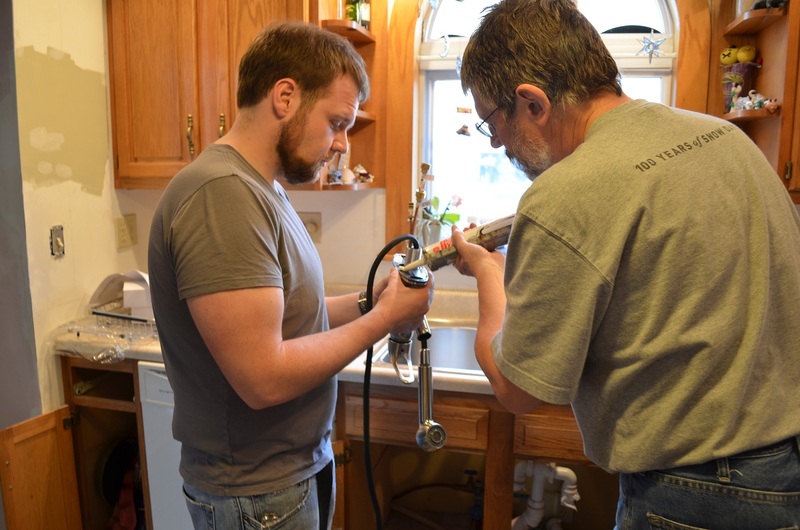 (Monday) Dad took some time off during the day to finish the plumbing. 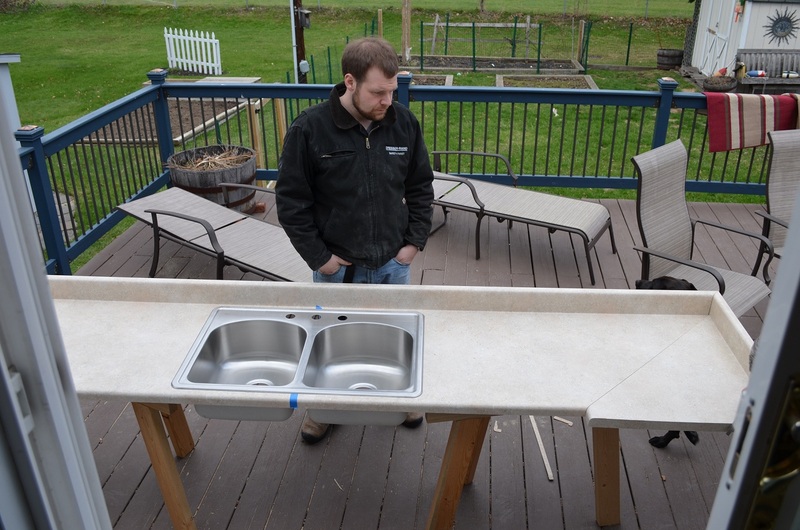 By time Bryan and I got home we had a fully functional sink!!!! Step 3: Painting. (Sunday and Monday) Towards the end of the day Sunday I actually got to paint! The new color is lovely. 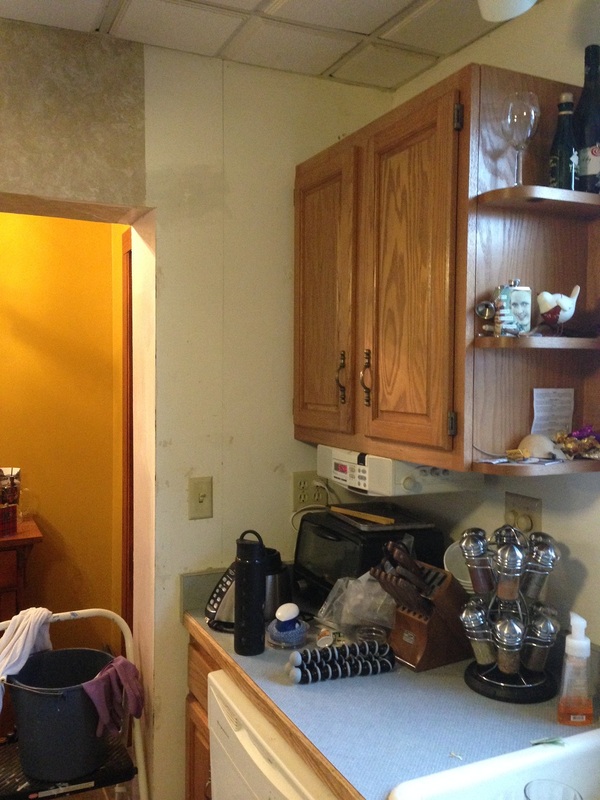 Only about half of the kitchen is painted with a first coat and we are very much looking forward to seeing what it looks like completely painted with 2 coats! It will definitely benefit us for a while as we aren’t really sure when we will sell. Plus a kitchen can really determine people’s feelings on a house. If we were staying we would be putting much more time/effort/money in it! Seneca is our ever helpful presence. She has gotten so much better but sometimes things are just too exciting for her to stay out of!